Edgo Energy has announced that it has signed a production sharing agreement (PSA) with the Ministry of Energy and Industry of the Republic of Tajikistan for license areas Surkhsimo and Qarordon in Tajikistan. The signing ceremony follows a review process by the Tajik Government and formal approval by the President of Tajikistan. The two license areas are located close to the Tajikistan – Afghanistan border and are part of the Tajik proven hydrocarbon basin. The production sharing agreement provides for a seven-year exploration period from November 18, 2013, and a thirty-year exploitation period (with two five year extensions allowed). In 2011 Edgo Energy completed a 2D seismic survey on the Surkhsimo license. 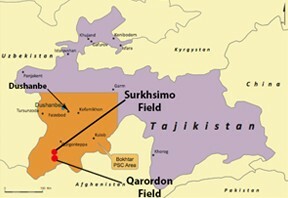 The Qarordon license area has produced gas and is connected by pipeline to the capital Dushanbe. Wells have been drilled in both license areas testing a mixture of gas and oil from the post salt horizons. The deeper pre-salt horizons have, according to the US Geological Survey, the potential for super-giant discoveries with multi billion barrels of oil equivalent to be found in the basin. In June 2013 CNPC and Total farmed into the Bokhtar license in the Tajik basin putting Tajikistan on a path to become a significant energy supplier to China and to become domestically energy independent.